In season one, a joint homicide/narcotics police detail is created to investigate a drug-dealing operation in the city of Baltimore. 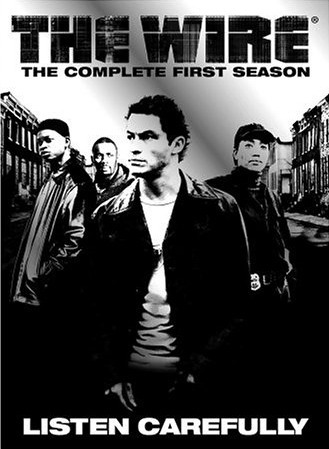 THE REVIEW: Other than The Sopranos, one of the television shows most cited as being the best of all time is The Wire. While I surely haven’t even gotten to the best stuff yet, already in the first season there is an abundance of greatness that only got better as the episodes progressed. If I had to point to The Wire’s defining characteristic for season one it would be consuming. Consuming could have a couple of meanings such as the consumption of drugs by characters like Bubbles (Andre Royo) or Detectives Jimmy McNulty (Dominic West) and Kima Greggs (Sonja Sohn) being consumed in their investigation of Avon Barksdale (Wood Harris) and his drug operation. But consuming is also the best way to describe what happens over the course of the season. Starting off with the opening scene of the pilot, “The Target”, you’re met with a whole lot of questions, some answers, and a general tone for the rest of the season. Season one is about drugs, murder, and uncovering secrets and personal motives. “The Target” starts you off slow and steady, like an outline of things to come. By episode three, “The Buys”, you’re pretty much up to full speed and consumed with everything going on. Mysterious characters like Lester Freamon (Clarke Peters) who start out quietly working on miniatures of furniture for doll houses are revealed to be a major player and a great detective the scrounges up the first picture of the main antagonist Avon Barksdale. Detective McNulty’s cavalier attitude gets some background which we can ground his character in and build off of. We also get to see just how far Barksdale’s crew is willing to go and how some members, like Wallace (Michael B. Jordon), are more hesitant. “The Buys” is also when we’re introduced to Omar Little (Michael K. Williams) who’s shrouded in his own set of mysteries and odd dealings that develop throughout the season. A more common way to describe how The Wire is consuming is to mention how detailed and colloquial the characters and the writing is. One of the things I enjoyed most about The Sopranos is how accurately it portrayed Italian-American families down to the food they eat and how they speak (or yell, rather). This time around I don’t have any personal stories or recollections to corroborate the lives of Baltimore police and residents, but as an outsider, this looks real enough to be akin to a documentary, albeit with some heavy dramatization. The only parts I have anything negative to say are the minor stories that are thrown in. For example, McNulty’s divorce from his wife and his ongoing relationship with assistant state’s attorney Rhonda Perlman (Deirdre Lovejoy), Bunk’s (Wendell Pierce) own extramarital activities in “Lessons”, and Daniels’ (Lance Reddick) conversations with his wife at home. These moments don’t necessarily distract you from the main story that’s going on, but they don’t always feel fully incorporated. The Daniels example in particular actually reveals some important information towards the end of the season and changes our perception of the his character. But as a whole, there could be more done with it. Instead of showing Daniels’ wife only in these few scenes as a way to provide exposition, flesh her out more and let her (and other characters) seem like they belong. Now all of these story pieces serve a role in the season at large and without them the show might not be as entertaining as it is. These pieces are the mortar, and while it might not be appealing all by itself, you still need the mortar to keep the bricks (main story) in place. In some cases, these minor asides do stand by themselves and behave as part of the whole. One example, also from “Lessons”, is when McNulty uses his kids to help spy on Stringer Bell (Idris Elba) in the mall. We get small character developments that broadens McNulty’s character and where his focus lies (more on his work than his family), but we learn key information about Stringer as well (we get a license plate and address) that helps with the case against Barksdale. THE TAKEAWAY: While the pilot episode of The Wire might be a bit slow, it has all the right questions and answers necessary to give you a foundation from which to expand and the curiosity to want to. By the third episode, there’s no turning back and you’ll be all in until the season ends (and then, of course, it’s on to the next season). While there are moments scattered throughout that don’t grab your full and undivided attention, for most of the season you won’t want to peel your eyes away. Even after one season, The Wire is one of the most engaging, energetic, and spellbinding shows I’ve ever seen.